Yona is the creation of Chef Jonah Kim, formerly of Baltimore’s Pabu and the increasingly prolific chef/restaurateur Mike Isabella. 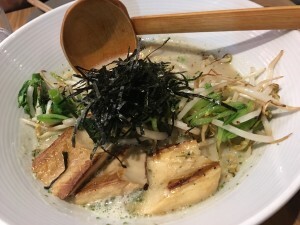 The menu focuses on Kim’s Korean heritage and Japanese training, There’s an emphasis on noodles. The restaurant is cozy and casual, with a long communal table occupying much of the 50-seat space. Isabella and his family are seated next to us, enjoying a tour of his establishments on the block which also include Kapnos Taverna and Pepita Cantina. I take a moment to turn my pre-dining debate into decisions. But I still have questions. 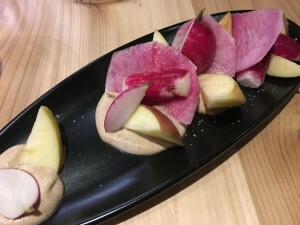 How can a deceptively simple combination of radishes and apples with sesame sauce be transformed into such a refreshing, and dare I say dazzling, starter? Why am I so taken with crisp brussels sprouts slathered with Japanese mayo and a dash of rice pearls? 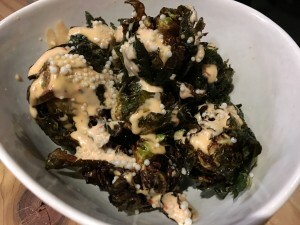 It seems as if I would be tired of this vegetable by now, but Chef Kim’s take reminds me that a creative spin can make brussels sprouts fresh again. How does Chef Kim impart so much flavor into his awe-inspiring veggie ramen? Is it the meaty eringi mushrooms that elevate this dish? The touch of black garlic oil? Or is it his use of soy milk-veggie broth? Pork….who needs pork? 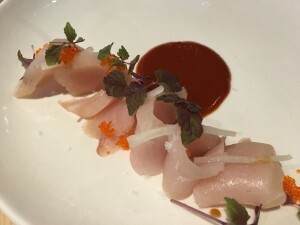 Delicate hamachi dusted with fish eggs is brightened by chojan- the Korean version of ketchup. Can we turn to this pairing in place of fries and ketchup? I say, yes. And finally, am I really going to have the uni waffle with caviar and taramasalata all to myself? Sometimes having a husband with food restrictions has its benefits. 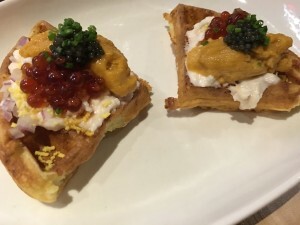 Greek taramasalata (a popular fish spread served at Kapnos) appears with uni and a dollop of caviar, served on a crisp waffle with a touch of sweetness to counter the salty accoutrements. It’s a highlight dish at Yona, probably best shared, but if that isn’t possible, go for it anyway. Miso-caramel panna cotta with apple sauce sorbet and a sesame cookie cracker is a cool exclamation point after all my questions. Yona is a new restaurant in Arlington that warrants attention, punctuated by multiple visits. There’s no question about it.